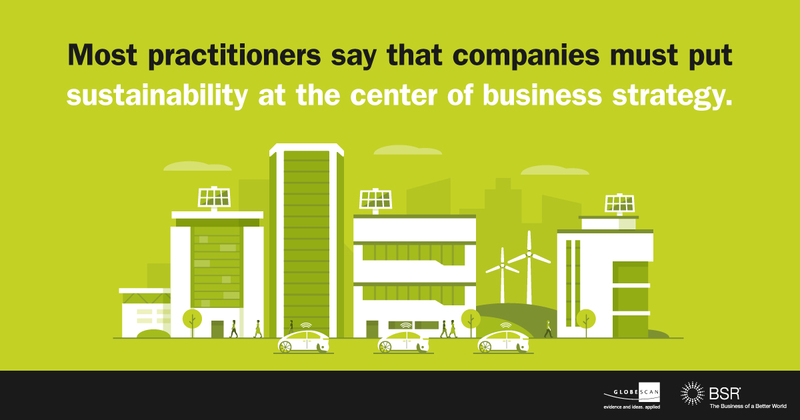 The past 10 years have seen incredible progress in sustainable business. There are global multi-stakeholder commitments on climate action and the SDGs, collaborations driving systemic change across value chains, and tremendous improvements in corporate and investor practices towards a more sustainable world. The BSR and GlobeScan State of Sustainable Business 2018 Survey is a great testament to the progress of corporate action and provides insight into how companies are preparing for the next 10 years as they respond to a rapidly changing world. Join us at BSR18 this fall for a conversation about 21st-Century Business Strategy. The survey, released today, includes responses from business leaders representing 152 global companies—more than 60 percent of BSR’s global membership network. This is the perspective of the people who do sustainability and corporate social responsibility work every day, inside some of the largest and most influential companies in the world. In recognition of our 10th year and the fact that BSR sees a changing global agenda, we updated the list of corporate sustainability priorities that we track. 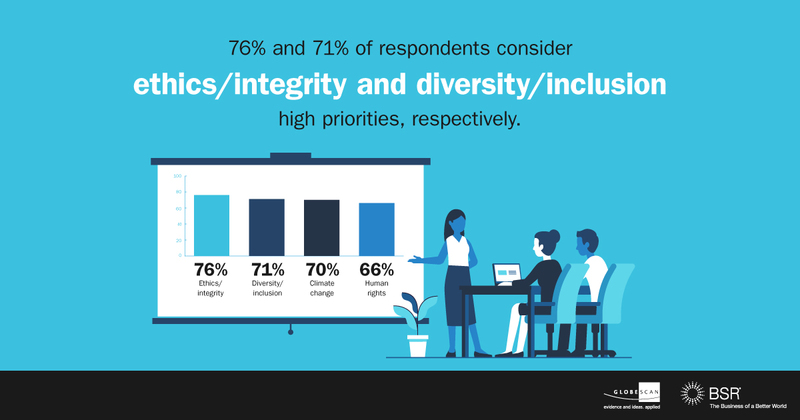 Interestingly, ethics/integrity and diversity/inclusion were on the list for the first time and jumped straight to the top two priorities for sustainability efforts over the next 12 months. While these are of course longstanding corporate issues, they are now increasingly viewed as part of the sustainability agenda—perhaps a reflection of global attention on these topics. Climate change and human rights have been the top priorities in the survey throughout the past decade, and they round out the top four. There appears to be less interest in issues more closely related to public policy, with one third of respondents stating that public policy frameworks are a low priority and only 11 percent stating that they want to influence policy frameworks to address new global opportunities and challenges. Given the systemic nature of these issues, this may constrain meaningful impact: Companies should rethink how to appropriately use their influence as part of their evolving approaches to managing sustainability. We also increasingly see that business is anticipating and responding to global mega-trends in order to create more resilient strategies for long-term success. 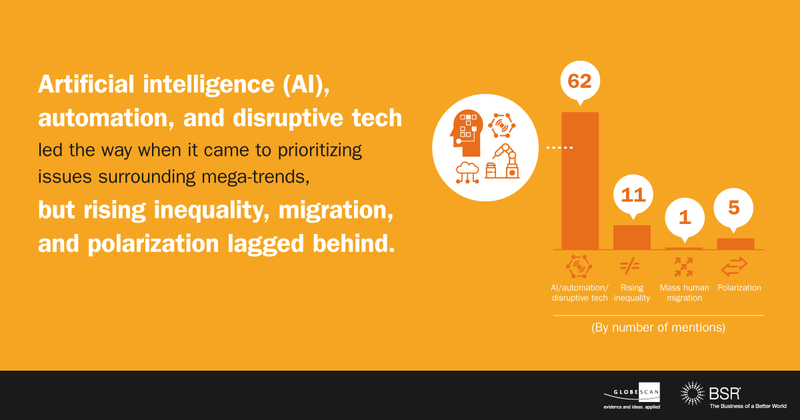 Disruptive technologies like artificial intelligence, concern over data privacy and ownership, and the impacts of our changing climate are clearly the mega-trends currently shaping future business strategies. That said, while 86 percent of technology/media companies recognize AI/automation as a mega-trend most impacting strategy, just over half of other sectors rated this as a “top three” trend. And in spite of its presence in the headlines today, data privacy, while a top trend influencing companies overall, was prioritized by less than one-third of consumer-facing companies. The implications of new technologies impact all aspects of society, and companies in non-tech sectors need to understand and prepare for this. Our recent series of working papers on this topic, Artificial Intelligence: A Rights-Based Blueprint for Business, explores how companies across industries can begin to do so. Further, less than 20 percent of company respondents rated geopolitics, rising inequality, polarization, or mass migration as one of the top three mega-trends. It could be that these are seen as secondary trends or the purview of government. 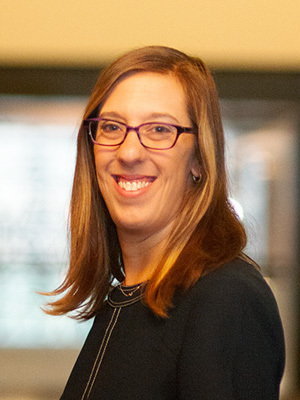 But given the impact that automation, artificial intelligence, and climate change are likely to have on employment and social upheaval and the disfunction in many government institutions, these trends are likely even more significant as they’ll shape the future context in which business operates. Perhaps the most exciting finding is that three quarters of corporate sustainability professionals say that sustainability needs to be better integrated into business strategy to address these global mega-trends. Despite the rhetoric about CEO activism and transparency, only 11 percent and 15 percent of respondents, respectively, viewed these as important actions to address these trends, focusing instead on core business activities, like strategy, value creation, and value chain collaboration. This focus on core strategy is comparatively lagging in North America, however, with 64 percent of those businesses selecting this option as an important opportunity for impact, compared to 86 percent in Europe and 89 percent elsewhere. While recognition of the need to engage with the strategic planning function is growing—it increased from 23 percent to 33 percent in just one year—sustainability teams still struggle to get traction with such engagement. Less than one-third of respondents believe they are currently engaging with strategic planning. We look forward to seeing this number jump in next year’s survey as companies make progress in creating and implementing resilient business strategies. This year’s survey findings reinforce that now is the time to embrace a New Blueprint for Business. Join us at BSR’s Annual Conference in New York this November, where together we will redefine business in pursuit of a more just and sustainable future.